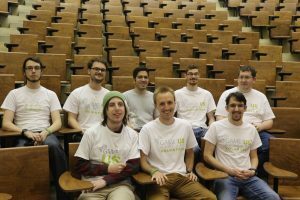 Game Jam 2017 attracted 58 registered participants who combined to create 18 different games over a 48 hour period last weekend. 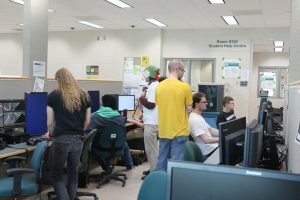 This bi-annual event held at the University of Saskatchewan provides an opportunity for novice and experienced game developers to learn and show off their game acumen. A tutorial was offered Thursday May 18th and many volunteers from the HCI Lab were on hand to help out. 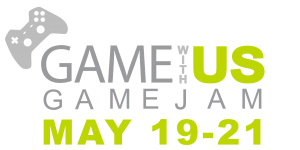 In addition, two guest speakers gave talks about their work in the games industry. Livio De La Cruz is a software engineer currently freelancing as a Unity gameplay programmer in Seattle. He enjoys opportunities to volunteer for educational programs that introduce kids to programming. Rodrigo Vicencio-Morerira is a former UofS student currently working as a software engineer at Capcom in Vancouver. He is one of the co-founders of the Game with US Game Jam. The secret theme “madness” was revealed at the start of the weekend and the teams incorporated it in a wide variety of ways in all the games. The 48 hour time constraint encourages creative thinking and cooperation between participants to use their backgrounds and skill sets to develop innovative or experimental games. While there is competition, in general, everyone worked to make everyone else successful. If there was a problem blocking progress, help could be found just by asking a neighboring team, or one of the on-site experts. The shared deadline and everybody working the same space brought energy and motivation to the group. Some teams essentially set up camp in the lab and worked until they were too exhausted to do any more. But that isn’t necessary at all – a lot of the winning games were made by teams that maintained regular sleep schedules and even doing so, didn’t need to rush. For the novices, it was about learning how to actually make something playable in that time frame. Arriving at the deadline with a game you made all on your own is super satisfying. It’s a rewarding personal accomplishment. Each obstacle overcome provided further motivation, and brought participants one step closer to something that was truly their own. The novice games were well done. For the veterans, it’s about pacing to make something fun and fresh in the time period without wearing yourself out. Veterans have learned how to prioritize features and work towards getting a product that they can show off earlier in the development process. Looking at the games from repeat participants, it’s easy to see how this pays off. This time, a lot of our participants were repeats, and the games were all impressive in their own ways. Congratulations to the organizers, volunteers, participants and especially the winning teams in the various categories. For names of the winners and links to their games go to http://gamewithus.ca.